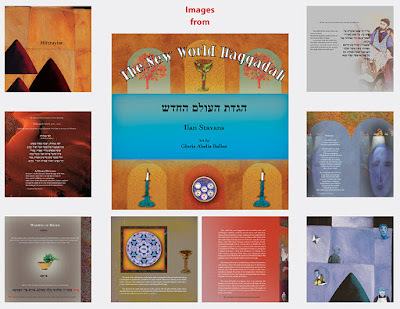 The New World Haggadah: This year, international prize-winning author Ilan Stavans and award-winning international artist (and, Abq Jew is proud to say, friend) Gloria Abella Ballen have combined their talents to create The New World Haggadah. Those of you who have seen Gloria's visually stunning work (see, for example, The Power of the Hebrew Alphabet) have a good idea of what to expect in this new project. And Gloria does not disappoint. 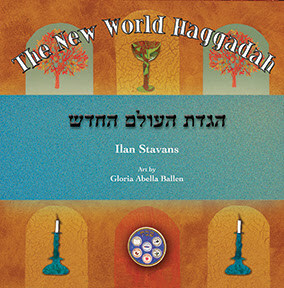 Here is what Ilan says about The New World Haggadah. My intention in The New World Haggadah is to make Moses emblematic of today’s complex world. Not too long ago, I discovered another poem by Emma Lazarus that in my eyes is quite similar to “The New Colossus.” It is called “1492” and it looks at that annus mirabilis as a fracturing moment, a kind of Big Bang that gave birth to a cornucopia of Diaspora events, each with its own metabolism. The Jewish Diaspora across the Mediterranean Basin, the Middle East, and the Atlantic Ocean to what we call the Americas is exemplified by a plethora of languages and traditions. I want to bridge the gap between North and South and between East and West, between Ashkenazim and Sephardim, and between Africans, Europeans, and mestizos. 1492 is the year that changed the world. For better or worse we were all born from the common wellspring of those events. Here is what Abq Jew says about The New World Haggadah. The strength of The New World Haggadah is that it is not traditional. Most (but not all) of the elements of the traditional Haggadah are represented here. Nevertheless, the most traditional among us will not wish to swap out their full-text Haggadot. But for those who are willing to engage with this non-traditional text (and, of course, the stunning visuals), the rewards are great. What makes this a new Haggadah is its multicultural—and multilingual—qualities, like growing up Jewish and speaking Yiddish in Catholic, Spanish-speaking Mexico. Even today, sitting at the Seder table looking at the matzah, maror, and other ubiquitous culinary ingredients, my mouth still salivates thinking about the cajeta in our Seders in Mexico. I have reconfigured the liturgy to be more embracing, inserting voices seeking freedom through renewal. Among others are the Ladino cumulative song Un Cavritico, a chant used during the Civil Rights Movement, a protest song, a traditional Judeo-Spanish song about Moses leaving Egypt, and a disquisition about having one’s heart divided by the medieval poet Yehuda Halevi. The gorgeous art of Gloria Abella Ballen enlivens every page.